You may be aware of Keydo security key, used to sign in to Google account. Google introduced it in 2014. Two step verification or 2-factor-authentication is the most popular method to add an extra layer of security to Google account. You can opt for SMS based OTP or Google Authenticator application to generate one time password or the Google authentication pop-up on android phones integrated in to Google play services. What ever the method to generate one time password, how do you know, that you are entering your account password in to real Google website? Most of the time, peoples enter their sign in credentials in to wrong, exactly similar looking website, that are not one, they are intended to go. The easy way is to look for Lock icon at your browser's address bar and see if the site is httpS. It may not always be the case. In case of Google account, specifically. You can use Google Chrome browser extension, recently released by Google. Password Alert is Google Chrome extension, designed specifically for Google Account users, that can alert you, if you are entering Google password, in to any website, that is not really Google. If you rely upon Google Account for every online activity, you must install this extension as matter of security layer. 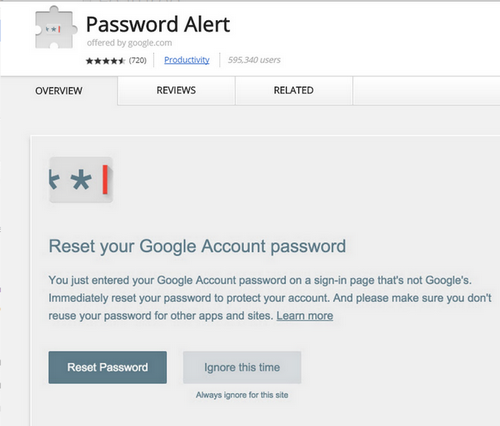 Get the Google Password Alert extension from Chrome Web store. You can learn more about, how exactly the extension works, and what information it collects, visit to this FAQ page. Oh, but I already get an e-mail from Google whenever there is a new signin from a new browser. Even works when you clear your cache and log in again, so no worries. It already works, without ANY extensions. Dear Henrik, Its exactly opposite of what you think of it. When you sign in to your REAL google account, you get the alert. But think of the situation, where YOU intentionally have entered Google credentials and think that keep going. You may get any email or not. Your password is in wrong hand and before you take any action, everything that is saved with your Google account is gone.